Your wedding day is one of the most special and important days of your life. You will have a million and one things going during the morning of your special day; don’t let worrying about your hair be one of them. 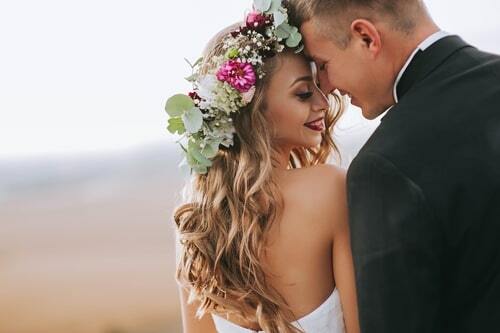 Here at Rumours Hair Salon we offer wedding hair and wedding party hair to brides and their bridal party that want fabulous looking hair for the big day. Our professional hair stylists can come to you so you don’t have to stress about getting to and from the hair salon on your special day, or you can come to us to get away from the busy atmosphere of everyone getting ready. We are here to help you enjoy your wedding day that little bit more, and reduce the stress of a busy, wonderful and magical day. Our friendly hair stylists provide a full consultation to plan and discuss your ideas and requirements in preparation for your special day. As soon as you know when you’re getting married we recommend you book in for a wedding hair consultation so we can talk about the hair length, hair colour and hairstyle want to achieve for your special day. We will then put a plan of action together with you to ensure that we meet colour and length needs by your special day. We can look after you and your wedding party in our hair salon, at your home or at your chosen wedding venue. We just need to book an initial wedding hair consultation in Sawtry to find out who’s hair we need to do and how we need to do it so we can tell you how long it will take and how much it will cost. Your wedding day is a very special day and we would be honoured to be a part of it. Please contact us now to book your wedding hair in Sawtry. We can travel around Sawtry, Peterborough and surrounding areas to create the wedding hairstyle of your dreams on your special day.